Sierra Leone has banned industrial fishing in its territorial waters for a month from Monday in a move to try to shore up stocks that was applauded by environmental activists. The government also decreed an April 1-30 halt to exports by major fishing companies "to protect our fish stock from depletion", said a statement from the fisheries ministry. "All industrial fishing companies should stock their fish in cold rooms ... during the period of closure," Minister of Fisheries Emma Kowa Jalloh told AFP. 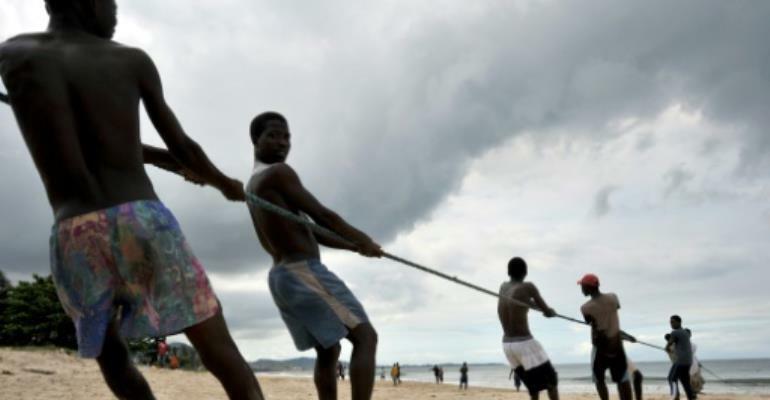 "We are happy that the government has declared fishing period closure after series of complaints," he told AFP at the bustling Tombo fishing community outside the capital Freetown. "Industrial fishing boats from China and Korea are destroying our nets and also depleting the fish stock," he said. "We are calling on the government to effectively enforce the ban with surveillance." "We applaud the ban but the long answer is for legal, equitable and sustainable fishing industry management to be introduced." "We are working towards helping Sierra Leone with surveillance boats and regulatory framework for sustainable fishing methods," Trent said. "Illegal fishing accounts for about 30 percent of catches by industrial foreign fleets in Sierra Leone, according to the 2017 Sea Around Us project at the University of British Columbia, the University of California at Berkeley and five other organisations.